The same face of the Moon is always presented to the Earth. Why? (a)	Revolution period of the moon is equal to the rotation period of the Earth. (b)	Moon doesn’t rotate around its own axis and remains stationary. (c)	Moon revolves around the Earth at the same speed as it rotates around its own axis. (d)	Both Moon and Earth has same rotational speed. 1.Area of Pacific Ocean is almost equal to area of all other oceans combined. More diversity of landforms can be observed in oceans than continents. Although Pacific Ocean is the largest ocean than other oceans, its area is far lesser than all other oceans area combined. Continental slope, Guyots, Trenches and other landforms can be observed in the ocean which is far diverse than the continents. Which of the above given pair is correctly matched? 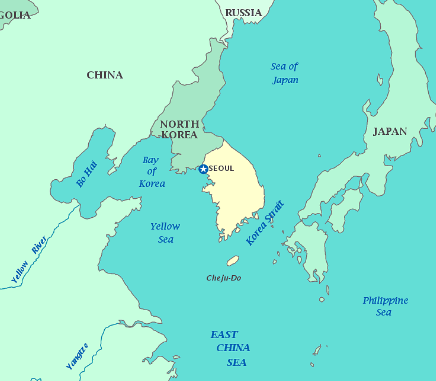 1.Yellow sea separates China and Korean Peninsula. 2.Sea of Japan separates Japan and China. (c)	Both 1 and 2. (d)	Neither 1 nor 2. 1.Terrestrial Planets are relatively larger in size when compared to Jovian Planets. 3.Terrestrial Planets has lost most of its earlier atmosphere due to solar wind, while similar phenomenon is not been observed in Jovian Planets. Terrestrial planets like Mercury, Venus and Earth are relatively smaller than the bigger Jovian planets like Jupiter, Saturn and Uranus. Terrestrial planets are closer to Sun and most of their early atmosphere is wiped out due to intense solar storm. Terrestrial planets are made up of solid rock whereas Jovian planets are gaseous in nature. 1.Annual range of temperature is greater in the Pacific Ocean than that in the Atlantic Ocean. 2.Annual range of temperature is greater in the Northern Hemisphere than that in the Southern Hemisphere. Annual range temperature is relatively low in larger ocean. Annual range temperature is relatively high in Northern hemisphere due to continental influence (Large land area in Northern hemisphere w.r.t southern hemisphere). Normally, Earthquakes causes irreparable damage to life and property. 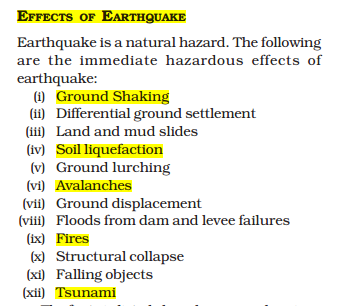 In this context, what are the immediate hazardous effects of Earthquake? Which of the following pair is not correctly matched? (d)	Guiana Highlands Northern parts of South America. Katanga plateau is present in Africa, Bolivia is present in South America. (a)	Super Ocean present in Paleozoic to Mesozoic transition. (d)	Super Continent present in Paleozoic to Mesozoic transition. Panthalasa is a super ocean present in Paleozoic to Mesozoic transition. A team of scientists at National Centre for Antarctic and Ocean Research has found large reserves of oil and natural gas in Arctic Ocean. 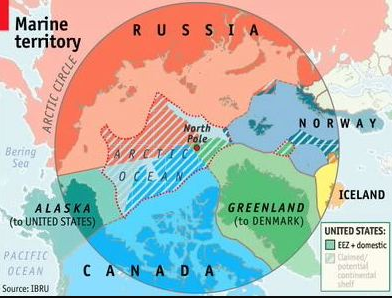 In this context, which of the following countries surrounds Arctic Ocean? Arctic Ocean surrounded by following countries. Composition of Earth as a whole: Iron > Oxygen > Silicon > Magnesium > Sulfur. Normally, ocean currents are under the greater influence of prevailing winds. Indian Ocean currents are largely under the influence of monsoon – A seasonal reversal of winds. 1.International Date Line is an absolute straight line which passes through the Bering Strait. 2.International Date Line is one where date changes by exactly one day when it crossed. International Date Line (IDL) is not a straight line like Greenwich Meridian. One who crosses the IDL gains or losses the day. If he/she cross towards eastwards gains one day (Towards Alaska). If he/she crosses towards westwards losses one day (Towards Fiji or New Zealand). Easy to remember: During 2017 New Year Celebration, few people celebrated new year in New Zealand at first and flew to California to celebrate it once again. Which of the above pair is correctly matched? Strait of Malacca connects Bay of Bengal and South China Sea and Strait of Gibraltar connects Mediterranean and Atlantic Ocean. Which of the following best describes the ‘Marine upwelling’? (a)	Periodic rise and fall of the ocean once or twice in a day. (b)	Rise in the sea level due to the global warming. (c)	Rise of deep cold water towards the surface of the ocean. (d)	Storm surges hitting the coast due to cyclonic activity. Consider the following statements regarding Earthquakes and Volcano. 1.Earthquake normally occurs along with the volcanoes. 2.Volcanoes only occur where ocean crust collides with continental crust. 3.Volcanoes are one of the best source of sulfur. Earth quakes are usually associated with volcanoes, since both are related to plate movements. Volcanoes can also happen with ocean-ocean crust collision. Best example is South East Asian Archipelago. Volcanoes are one of the best source of sulfur, which is not abundant on other continental landforms. In addition to gravitational force, which of the following process can bring dynamic changes on earth’s crust? All will bring dynamic changes on the earth. 1.Orion will serve as the exploration vehicle that will carry the crew to space, provide emergency abort capability, and sustain the crew during the space travel. 2.Orion spacecraft is built to take humans farther than they’ve ever gone before. 3.Orion will launch on Space-X new heavy-lift rocket, the Falcon Heavy. NASA’s Orion spacecraft is built to take humans farther than they’ve ever gone before. Orion will serve as the exploration vehicle that will carry the crew to space, provide emergency abort capability, sustain the crew during the space travel, and provide safe re-entry from deep space return velocities. Orion will launch on NASA’s new heavy-lift rocket, the Space Launch System. 2.The first five biggest spending countries accounts for 60% of the total military expenditure in the world. The Swedish Parliament established the Institute in 1966 with the legal status of an independent foundation. SIPRI is an independent international institute dedicated to research into conflict, armaments, arms control and disarmament. The first five biggest spending countries like US, China, Saudi Arabia, Russia and India accounts for 60% of the total military expenditure in the world. Which of the following countries have signed The Joint Comprehensive Plan of Action with Iran in 2015? (d) ISRO’s proposed exploratory mission to Jupiter’s icy moon Europa. BepiColombo is a joint mission between ESA and the Japan Aerospace Exploration Agency (JAXA), executed under ESA leadership. It will set off in 2018 on a journey to the smallest and least explored terrestrial planet in our Solar System. When it arrives at Mercury in late 2025, it will endure temperatures in excess of 350 °C and gather data during its 1 year nominal mission, with a possible 1-year extension. Which of the pairs given above is/are matched? India, Sri Lanka joint naval exercise SLINEX-2018 was recently held at Trincomalee, Sri Lanka. INDO-US joint military exercise Yudh Abhyas 2018 was conducted in the foothills of Himalayas at Chaubattia in Uttarakhand. It is the 14th edition of the joint military exercise hosted alternately by both countries. 2.It tests the technical ability of post graduates in selected universities. PISA is assessment test for 15-year-olds, organised every three years by Organisation for Economic Cooperation Development (OECD), Paris, France. It was started in 2000 with about 43 states participating, and its latest edition in 2015 saw participation from 73 countries including China and Vietnam. PISA measures student performance in mathematics, reading, and science and even innovative subjects like collaborative problem-solving and money literacy. Which of the following countries are designated as Nuclear Weapon State under Non-Proliferation Treaty? Five countries are considered to be nuclear-weapon States (NWS) under the terms of the Treaty on the Nonproliferation of Nuclear Weapons (NPT). In order of acquisition of nuclear weapons these are: the United States, Russia (the successor state to the Soviet Union), the United Kingdom, France, and China.